Every chainsaw user knows the benefit of having a well-sharpened chainsaw. It oozes efficiency and is safe. A dull chain is a risk by itself as it may fly the engine and do some considerable harm to the user. Another good reason to sharpen your chainsaw is to keep the rust off. 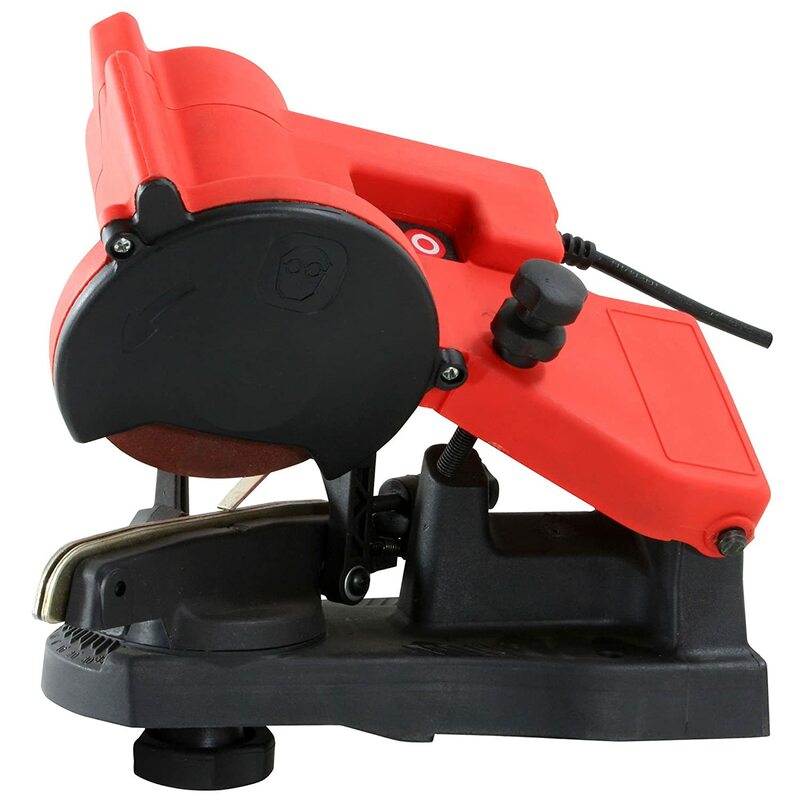 In the following review, we look at several chainsaw sharpeners to help you determine the best one – you deserve nothing but the best. 1 Why Sharpen the Chainsaw Chain? Why Sharpen the Chainsaw Chain? Well, for starters, using a dull chain is counterproductive. It consumes a lot of fuel, is inefficient and wears pretty fast – the friction is higher on flat cutters. A flat chain is also dangerous to use as the risk of kickbacks increase. Sharpening the chainsaw chain maintains it and more importantly makes it safe. A sharp device is efficient, time-saving and a joy to use. A chain sharpener is one device chainsaw owners should never be without. There are different types of sharpeners and all work differently from each other. However, if you have a choice, then electric chainsaw sharpeners are better. They extend the life of the blade on the chainsaw and are more accurate. A manual sharpener has a guide that indicates the correct angle for filing the edge. You then sharpen the chain after moving the file across the guide. There are two types of electric sharpeners: bench and handheld. The handhelds are more portable and sharpen the chain as you hold them. You move it to sharpen the cutters. Between the two electric varieties, the bench-mounted sharpeners are better. They are more accurate as you get to sharpen the chain on a stable surface where you have more control. All you need to do is secure the chainsaw and turn the sharpener on to work on it. You then turn it off and repeat the process after adjusting the chain. Using the bench-mounted isn’t too hard. But precautions are necessary to ensure you don’t file the cutters too low as doing so could ruin it or make it too dangerous. The handhelds have a spinning disc that specifically files the cutters. It has guides to help maintain an accurate angle. However, handhelds demand a higher level of concentration so that you may avoid filing the wrong angle – this would ruin the cutters. The Workload: it is always important to determine the frequency of using the chain sharpener. You should note that not all sharpeners can handle several chains. If yours is a heavy duty enterprise where you will need to sharpen on a daily basis, then choose one that can take the stress of regular use. Power Source: typically, you will find there are motorized and manual sharpeners. It is all down to preference and the amount you are willing to invest. There are convenient battery-powered and electric-powered chainsaws. Manual sharpeners may seem like they are out to save you on energy costs, but that may not be the case.The time spent trying to find the right angle may be significant. There is also the efficiency factor. The sharpening accuracy and efficiency you achieve with an electric machine are incomparable to anything. Portable/ mounted: the portable sharpeners are quite the convenient types. They are ideal for chainsaw users that are always on the move and going back to the workshop may be impractical. The portables may not be as quick and as efficient as the bench-mounted sharpeners, but you will be okay once you come around to learning the basics.Those that are confined to the workshop may find the bench mounted chain sharpeners sufficient. And if there is no bench space for the sharpener, wall mounting will still fill the void. Brand: there are so many products on the market that choosing the right one is sometimes akin to solving a complex equation. The easiest way to get quality products is to source them from an established brand. A company known for their quality products will still produce quality. This is like buying a vehicle from Porsche – you are sure you will be getting among the best in the market. Budget: you will still find sharpeners whose price range is almost at the bottom of the pile and yet demonstrate quality. If you are just out for something to occasionally sharpen a chainsaw chain that you use at home for small tasks here and there, then there is no reason you should get something expensive. However, this does not apply if you chainsaw is one busy equipment. Get something that will overcome the stresses of everyday use – this will obviously need a few extra coins. This file sharpener is for the people that are on the move. You can quickly throw it into the pocket and move along. It is lightweight and easy to use. And one thing about file sharpeners is that they do not require any power to operate. The file sharpens in three strokes, and so it may be efficient for you. The thing about electric sharpeners is that they are pretty fast and efficient. This motorized tool sharpens each tooth in seconds, so you quickly get back to what you were doing. The chainsaw sharpener is not that hard to use – a few following of instructional manual and is set to do your first sharpening. Ideally, a durable sharpener will save you time and money. This product is both durable and quality – you may not need to look to look elsewhere for alternatives. This kit contains all the tools that a professional chainsaw user may require to keep their chainsaw sharp and to work as it should. They are made from high-quality steel for durability. You may use the kit for a long time. The file holder has maybe the perfect design to help you achieve the required angle when sharpening. 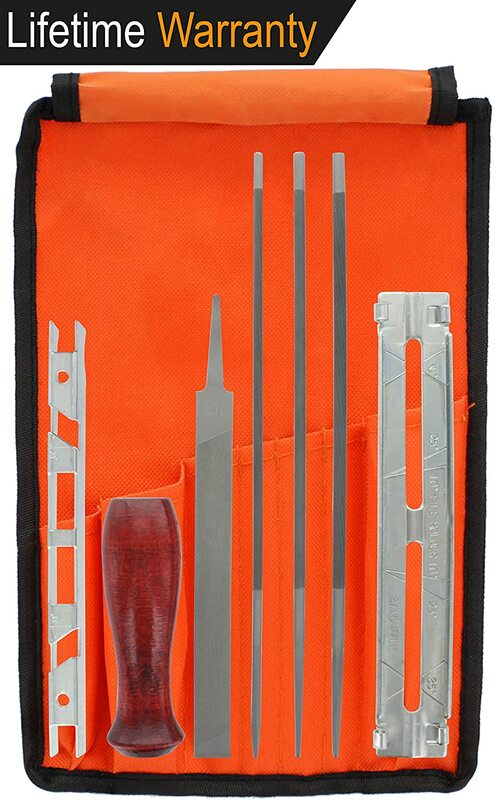 This kit also comes with a functional and robust pack to carry all the necessary sharpening tools and accessories you may need. There are benefits to using mountable sharpeners and among them is that they are easy to use. As this sharpener may demonstrate, they are quite effective in comparison to the manual devices. They may also be better than their handheld counterparts – we are talking about efficiency here. The device easily mounts to the bench or wall for stability and more comfortable access when using them. This same stability is what helps you acquire the right angle for a clean sharpening task. The best chainsaw chain sharpener makes your chainsaw effective and long lasting – they are some of the tools chainsaw users should never be without. Other benefits of having a sharp chainsaw include fuel efficiency and safety. 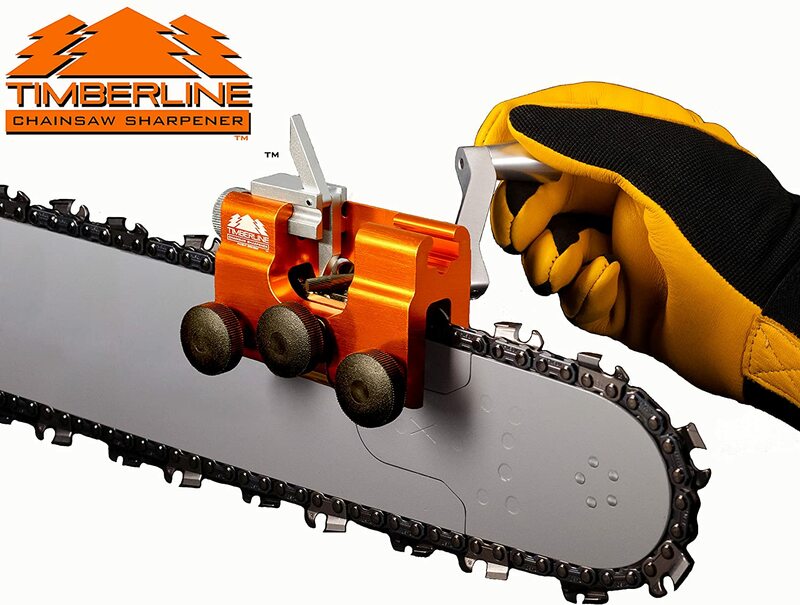 Our top choice from the above reviewed is the Timberline Chainsaw Sharpener with 3/16″ Carbide Cutter and for obvious reasons. The sharpener is motorized and quite fast that you are done with your sharpening within minutes. It is portable and lightweight – you can comfortably backpack it to your place of work. The machine is also efficient and leaves the chainsaw eager to jump into its next task.